Tynesider Steve Bruce is determined to turn around Aston Villa’s fortunes, and hopes to start away to Championship front-runners Newcastle United on Monday night. Villa, relegated alongside the Magpies last season, have endured a dismal starts to 2017, with just one point picked up from seven league matches to leave them in 16th place, just seven points above the drop zone. Manager Bruce, asked about how he could get Villa back on track, said: “It’s amazing what a touch of confidence can do. “I remember when I walked through the door four months ago and we snuck a result at Reading – and it gave everyone a lift overnight because we hadn’t won away from home for so long. “We have to go and get a result however it happens and then it turns. “Look at Mick McCarthy’s Ipswich – they get a result against us and then get another one against Brighton. It’s how it turns around. Bruce spent big in January to bolster his squad for a push at the play-odds, but is yet to get the performance levels up. “Six weeks ago we were looking to see if we could catch the top ones – we were a few points off it,” said the former Sunderland manager. “We’ve had a horrible few weeks, that’s what it is. It can happen. “What do you do? You see it through, cope with it, do the basics, stop making mistakes and go and sneak a win. 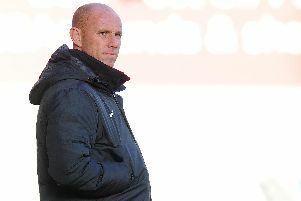 “I do believe the club is in a healthier position (with the new signings) – even from when I took over four months ago. “I have brought in some very good young players who are desperate to achieve something with this club. Bruce admits that the Magpies will be a tough nut to crack. He added: “Many would say this game should be in the Premier League, but it isn’t and that just shows you how difficult it is.